1Ward 10, Liberton Hospital, Edinburgh; School of Health Sciences, Queen Margaret University, Edinburgh, United Kingdom. 2School of Health Sciences, Queen Margaret University, Edinburgh, United Kingdom. *Address correspondence and reprints request to: Muhammad A. Saddiqui, School of Health Sciences, Queen Margaret University, Edinburgh, United Kingdom. Type 1 Diabetes mellitus is known to have a major psychological impact on adolescents. Different types of therapies have been developed to support the patient as well as their families to deal with this impact. These include Behavioral Family Systems Therapy and Cognitive Behavioral Therapy. However, studies conducted recently, though few in numbers have shown a direct relationship between general psychological functioning and metabolic control. Self-management of diabetes and its complication therefore, is an integral part of these program. This review looks into the various studies carried out that decide the best approach towards addressing the psychological aspect of type 1 Diabetes Mellitus. Keywords: Diabetes; Adolescents; Psychology; Depression; Stress. Medicine Unit 2, Christian Medical College, Vellore, TN India. *Address correspondence and reprints request to: Thambu David Sudarsanam, Medicine Unit 2, Christian Medical College, Vellore, TN India. Objectives: Tuberculous meningitis (TBM) is a major clinical and public health problem, both for diagnosis and management. We compare two established scoring systems, Thwaites and the Lancet consensus scoring system for the diagnosis of TB and compare the clinical outcome in a tertiary care setting. Methods: We analyzed 306 patients with central nervous system (CNS) infection over a 5-year period and classified them based on the unit’s diagnosis, the Thwaites classification as well as the newer Lancet consensus scoring system. Patients with discordant results-reasons for discordance as well as differences in outcome were also analyzed. Results: Among the 306 patients, the final diagnosis of the treating physician was TBM in 84.6% (260/306), acute CNS infections in 9.5% (29/306), pyogenic meningitis in 4.2% (13/306) and aseptic meningitis in 1.3% (4/306). Among these 306 patients, 284 (92.8%) were classified as "TBM" by the Thwaites" score and the rest as "Pyogenic". The Lancet score on these patients classified 29 cases (9.5%) as 'Definite-TBM', 43 cases (14.1%) as "Probable-TBM", 186 cases (60.8%) as "Possible-TBM" and the rest as "Non TBM". There was moderate agreement between the unit diagnosis and Thwaites classification (Kappa statistic = 0.53), as well as the Lancet scoring systems. There is only moderate agreement between the Thwaites classification as well as the Lancet scoring systems. It was noted that 32/ 284 (11%) of patients who were classified as TBM by the Thwaites system were classified as "Non TBM" by the Lancet score and 6/258 (2%) of those who were diagnosed as possible, probable or definite TB were classified as Non TB by the Thwaites score. However, patients who had discordant results between these scores were not different from those who had concordant results when treatment was initiated based on expert clinical evaluation in the tertiary care setting. Conclusion: There was only moderate agreement between the Thwaites' score and the Lancet consensus scoring systems. There is need to prospectively evaluate the cost effectiveness of simple but more effective rapid diagnostic alogrithm in the diagnosis of TB, particularly in a setting without CT and MRI facilities. Keywords: Tuberculosis; Meningitis; Scoring systems; Thwaites score; Lancet Consensus score; Agreement. 1Laboratory of Molecular Biology, Medical Research Center (CICMED), Autonomous University of the State of Mexico (UAEMex); Maternal-Perinatal Hospital "Monica Pretelini" (HMPMP); Asociación Científica Latina (ASCILA) and Ciprés Grupo Médico (CGM). 2Laboratory of Toxicology, Departament of Pharmacy, Faculty of Chemistry, UAEMex. 3Faculty of Chemistry. UAEMex. Toluca, Mexico. 5Laboratory of Molecular Biology, CICMED, UAEMex. Toluca, Mexico. 6Bpharma. Faculty of Chemistry, UAEMex. Toluca, Mexico. *Address correspondence and reprints request to: Hugo Mendieta Zerón, Laboratory of Molecular Biology, Medical Research Center (CICMED), Autonomous University of the State of Mexico (UAEMex); Maternal-Perinatal Hospital "Monica Pretelini" (HMPMP); Asociación Científica Latina (ASCILA) and Ciprés Grupo Médico (CGM). Objective: Nuclear factor kappa B (NF-κB) pathway and oxidative stress participate in endothelial dysfunction, which is one of the causes of pre-eclampsia. Among the human antioxidant mechanisms, there are the enzymes catalase (CAT), glutathione peroxidase (GPx) and superoxide dismutase (SOD). Our aim was to measure NF-κB, its inhibitor (IKK) and oxidative stress in placenta and umbilical cord of pregnant women submitted to a supervised nutritional program. Methods: Two groups were conformed: A) 14 pregnant women with individualized nutritional counseling, and B) 12 pregnant women without nutritional guidance. NF-κB and IKK were assessed by real time PCR (RT-PCR). Enzymatic activity of CAT, GPx, lipoperoxidation (LPO) and SOD were also evaluated. Results: Pregnant women that followed a supervised nutritional program had lower levels of systolic (p=0.03) and diastolic pressure (p=0.043) although they were heavier than the control group (p=0.048). Among all the women, the Spearman correlation was positive between weight gain and placental NF-κB expression (1, p≤0.01). In the placenta, women with nutritional advice had lower enzymatic activity of GPx (p≤0.038) and showed a tendency of IKK to be higher than in women without a nutritional supervised program. Conclusion: A supervised nutritional program in pregnancy offers a proven option to control weight gain, hypertension, NF-κB/IKK complex expression and oxidative stress reactions in the placenta. Keywords: Diet; NF-κB; Oxidative stress; Pre-eclampsia; Pregnancy. 1Department of Obstetrics and Gynecology, Sultan Qaboos University Hospital, Al Khoud, Sultanate of Oman. 22nd Year Medical Student, Sultan Qaboos University, Al Khoud, Sultanate of Oman. 3Department of Hematology, Sultan Qaboos University Hospital, Al Khoud, Sultanate of Oman. *Address correspondence and reprints request to: Nihal Al-Riyami, Department of Obstetrics and Gynecology, Sultan Qaboos University Hospital, Al Khoud, Sultanate of Oman. Objective: The aim of this study is to compare the neonatal outcomes of monochorionic and dichorionic twin pregnancies. 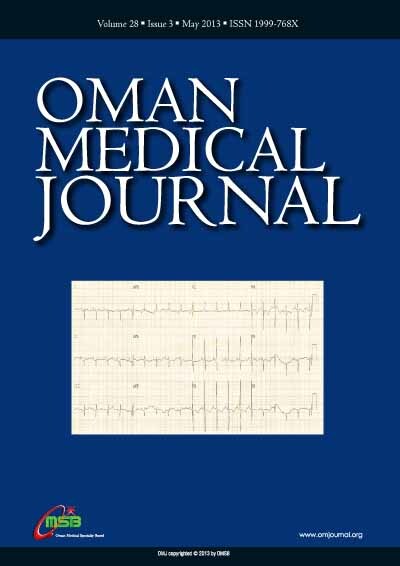 Methods: A retrospective cohort study involving 51 twin pregnancies followed and delivered at Sultan Qaboos University Hospital was conducted between January 2006 and December 2011. Result: Thirty six (71%) pregnancies were dichorionic diamniotic (DCDA), 14 (27%) were monochorionic diamniotic (MCDA), and one (2%) was monochorionic monoamniotic (MCMA). The antepartum complications noted in the 15 monochorionic twins were discordant fetal growth in 2 (14%) cases, low birth weight in 11 (73%) babies, pre-eclampsia in three mothers (21%) and twin to twin transfusion syndrome in four (29%) cases. Fetal respiratory distress affected eight (57%) of the pregnancies. Six (40%) twin sets were delivered before 30 weeks, 4 (27%) sets at 31 to 32 weeks, 2 (13%) sets at 34-35 weeks, 2 (13%) sets at 36-37 weeks, and 1 (7%) at 37-38 weeks. Fifteen mothers delivered 16 live infants, 9 (30%) stillbirths and 5 (17%) died after birth. Most neonatal deaths were due to neonatal sepsis and pulmonary hypoplasia. Dichorioinic twins, (DC) morbidity was seen in 11% and 40% for monochoroinic twins (MC). Mortality rate was 17% for DC and 47% for MC twins. Conclusions: Perinatal morbidity and mortality remain high among monochorionic twins. This is likely due to frequent twin-to-twin transfusion syndrome, prematurity, fetal growth restriction and intrauterine fetal death. Improved fetal and neonatal management may result in improved outcomes. Keywords: Twins; Monochorionic; Dichorionic, Outcome. 1Department of Reproductive Health, Tehran University of Medical Sciences, Tehran, Iran. 2Department of Midwifery, Mazandaran University of Medical Sciences, Sari, Iran; Nasibeh Nursing and Midwifery faculty, Vesal Street, Amir Mazandarani Boulevard, Sari, Mazandaran Province, Iran. 3Department of Psychiatric, Psychiatry and Psychology Research Centre, Tehran University of Medical Sciences, Tehran, Iran. 4School of Public Health, Knowledge Utilization Research Center, Tehran University of Medical Sciences, Tehran, Iran. 5Department of Nursing, Tarbiat Modares University, Tehran, Iran. Objectives: The prevalence of smoking among adolescents varies in different parts of the world. The current study aims to survey the socio-demographic and family characteristics related to adolescent lifetime cigarette smoking among 1201 Iranian adolescents aged 15-18 years old. Methods: This study is a population-based cross-sectional survey conducted using the multistage random cluster sampling method in Tehran, Iran in the summer of 2010. Results: The prevalence of lifetime cigarette use amongst boys (30.2%) was about 1.5 times that of girls (22.2%), (p=0.002). Older age, low parental control, very little parental supervision in the adolescent’s selection of friends, and having a friend or family member who smokes were associated with lifetime cigarette use among male adolescents. Moreover, the use of verbal punishment by the parents was a protective factor for female lifetime cigarette use. Smoking has become one of the great health threats among Iranian adolescents. Conclusions: As a result, health promotion programs should be gender based whilst educational and interventional programs for preventing tobacco use should begin before adolescence. Keywords: Adolescent; Smoking; Cigarette; Family behavior; Tehran; Iran. Associate Professor, Department of Physiology (29), College of Medicine, PO Box 2925, King Saud University, Riyadh 11461, Kingdom of Saudi Arabia. Objectives: This study was aimed to determine plasma levels of total (TFPI-T) and free (TFPI-F) tissue factor pathway inhibitor, plasminogen activator inhibitor-1 (PAI-1), and tissue plasminogen activator (t-PA) in a cohort of Saudi patients with chronic stable angiographically defined coronary artery disease (CAD) and to determine its correlation with its severity. Methods: This cross sectional study was conducted in the department of physiology and department of cardiology, College of Medicine, and King Khalid University Hospital and King Saud University, Riyadh. Sixty known cases of CAD who had undergone angiography (35 males and 25 females) were selected. A control group included 39 (20 males and 19 females) healthy subjects. Fasting venous blood samples were analyzed for total (TFPI-T) and free (TFPI-F) tissue factor pathway inhibitor, plasminogen activator inhibitor-1 (PAI-1), and tissue plasminogen activator (t-PA). Gensini scores and vessel scores were determined for assessing CAD severity. Results: There were non-significant differences between age, body mass index (BMI) and Blood pressure between the controls and CAD subjects. A comparison of hemostatic markers between control and CAD patients showed significantly higher levels of Fibrinogen, PAI-1, TFPI-T and TFPI-F in CAD patients compared to control subjects. But there was no difference in plasma t-PA levels. TFPI-T had a significant positive correlation with severity of disease determined by Gensini Scores (r=0.344; p=0.006) and vessel scores (r=0.338; p=0.015). Conclusion: Plasma levels of total tissue factor pathway inhibitor are significantly related with the presence and severity of CAD. Elevated levels of TFPI-T may be considered as useful diagnostic and prognostic markers in patients with CAD. Keywords: Coronary artery disease; Hemostasis; Gensini score; Angiography total tissue factor pathway inhibitor; Free tissue factor pathway inhibitor; Plasminogen activator inhibitor-1; Tissue plasminogen activator. Department of Pediatrics, Imam Reza Hospital, Kermanshah University of Medical Science, Boulevard, Kermanshah, Iran. *Address correspondence and reprints request to: Mitra Hemmati, Department of Pediatrics, Imam Reza Hospital, Kermanshah University of Medical Science, Boulevard, Kermanshah, Iran. Objective: Diabetes mellitus is the most common chronic endocrine disease worldwide. Intensive glycemic control plays an important role in decreasing morbidity and mortality rate of the disease. Preclinical studies have shown that biotin has an essential role in regulating blood glucose and serum lipid metabolism. This study aims to evaluate the effect of biotin on glycemic control and plasma lipids concentrations in type 1diabetic patients. Methods: This randomized double-blind placebo-controlled clinical trial study was conducted 70 type 1 diabetic patients with an age range 5-25 years old with poorly controlled (glycosylated hemoglobin ≥8%). Subjects were randomly allocated into two groups. In the intervention group biotin (40 microgram/kg) was administered plus daily insulin, while the control group received placebo plus daily insulin regimen for three months. Laboratory tests including glycosylated hemoglobin (HbA1c), fasting blood sugar and plasma lipids were measured at the base and after 3 months. Results: In this study, seventy patients were evaluated, 35 were allocated to each group. There were no statistically significant differences between age, gender, duration of diabetes, BMI and BP between the two groups (p>0.05). HbA1c in the intervention (biotin) group was 9.84±1.80 at base and after 3 months treatment, it declined to 8.88±1.73 (p<0.001). In the control group HbA1c at base was 9.39±1.58, after 3 months it increased to10.11± 1.68. There were statistically significant differences in the mean of HbA1c in both the biotin and the control groups (p<0.001). FBS in the biotin group at base was 275±65.76 mg/dl and after 3 months it had reduced to 226± 41.31 (p<0.001). There were statistically significant differences in the mean of total cholesterol, low density lipoprotein cholesterol and triglyceride between the two groups at the end of 3 months (p<0.05). Conclusion: Results of this study showed that biotin administration as an adjuvant in addition to insulin regimen can improve glycemic management and decrease plasma lipids concentrations in poorly controlled type 1 diabetic patients. Keywords: Type one diabetes mellitus; Biotin, Serum lipid; HbA1c. 1Department of Child Health, Sultan Qaboos University Hospital, P.O. Box 38, PC 123, Al Khoud, Sultanate of Oman. 2Department of Pharmacology, Sultan Qaboos University Hospital, P.O. Box 38, PC 123, Al-Khoud Sultanate of Oman. *Address correspondence and reprints request to: Reem Abdwani, Department of Child Health, Sultan Qaboos University Hospital, P.O. Box 38, PC 123, Al Khoud, Sultanate of Oman. Objective: While SLE is found worldwide, there is diversity in clinical presentation of the disease according to geographical variations. The aim of this study is to describe geographical distributions of childhood onset SLE within Oman to identify geographical clustering and to compare the demographic, clinical, and immunological characteristics of this cluster against the rest of Oman. Methods: We retrospectively reviewed the hospital charts of 104 consecutive children with childhood onset SLE who were seen in pediatric rheumatology centers in the Sultanate of Oman over a 15-year period between 1995 and 2010. Results: Geographical clustering of childhood onset SLE was identified in Sharqiya region, which constituted 41% (n=43) of all cases in Oman. This cohort of patients had characteristic disease features which consisted of significantly more boys affected with SLE compared to the rest of the country (42% versus 15%; p=0.002). These children also tended to be younger (10.3 versus 16.5 years; p=0.001), diagnosed at an earlier age (6.4 versus 9.4 years; p<0.001) with a stronger family history of SLE (58% versus 33%; p=0.010). These children also had increased incidence of mucocutanous changes (81% versus 62%; p=0.036) and decreased hematological abnormalities (30% versus 51%; p=0.036). Conclusion: We identified geographical clustering of childhood onset SLE to Sharqiya region in Oman which is associated with unique demographical and clinical features. Whether increased prevalence of disease in this region is due to geographical, environmental, ethnic or genetic factors is yet to be determined. However, it is likely to be interplay of known and other unrecognized factors. Keywords: SLE; Oman; Lupus; Demography. 1Oman Medical Specialty Board, Muscat, Sultanate of Oman. 2Cardiothoracic Surgery, Department of Surgery, Royal Hospital, Muscat, Sultanate of Oman. 3Pediatric Cardiology, Department of Pediatrics, Sultan Qaboos University Hospital, Al-Khoud, Sultanate of Oman. *Address correspondence and reprints request to: Asim Al Balushi, Oman Medical Specialty Board, Muscat, Sultanate of Oman. The clinical presentation of coarctation of aorta (CoA) is well known; however, it is the most common congenital heart disease in the newborn period to be missed, with significant mortality and morbidity associated with missing the diagnosis. We report a 20-day-old newborn boy who presented with congestive heart failure and weak femoral pulses. Chest X-ray (CXR) showed cardiomegaly and pulmonary edema and electrocardiography (ECG) showed extreme right axis deviation and absent left ventricular forces in the left precordial leads. Based on these, clinical suspicion of coarctation of aorta was made and confirmed by echocardiography. After initial stabilization with prostaglandin E2 infusion, child underwent urgent coarctation of aorta repair with uneventful post-operative course. High index of suspicion for coarctation of aorta in a newborn with such presentation is required and urgent referral to Pediatric Cardiology and cardiac surgery center is mandatory to reduce the morbidity and mortality associated with missing the diagnosis. Keywords: Coarctation of the aorta; Congenital heart disease. Department of Hematology, Sultan Qaboos University Hospital, Al-Khoud, P.O.Box 35 Muscat 123, Sultanate of Oman. *Address correspondence and reprints request to: Mohammed Al Huneini, Department of Hematology, Sultan Qaboos University Hospital, Al-Khoud, P.O.Box 35 Muscat 123, Sultanate of Oman. We report here four cases of genital ulcers that developed after the administration of all-trans retinoic acid (ATRA) for the treatment of acute promyelocytic leukemia (APL). Between October 2007 and March 2010, three males and one female (age range 19-35 years) were identified to have genital ulcers after being prescribed all-trans retinoic acid (ATRA) as a part of chemotherapy for APL. This is the first series of cases describing genital ulcers, as a unique and rare complication of ATRA used for treatment of APL in these patients, with no other cause identified. Following temporary cessation of ATRA for a few days in these three cases, improvement of the ulcers was noted. Keywords: Acute promyelocytic leukaemia; All-trans retinoic acid; Fever; Scrotal ulcers; ATRA. Oman Medical Board, Muscat, Sultanate of Oman. *Address correspondence and reprints request to: Matllooba Al-Zadjali, Oman Medical Board, Muscat, Sultanate of Oman. In the summer of June 2011, the first case of Crimean-Congo hemorrhagic fever (CCHF) was observed in Oman since the last fifteen years. The first blood sample using reverse transcriptase polymerase chain reaction (PCR) test were sent looking for CCHF, tick-borne encephalitis, dengue, Japanese encephalitis, Chikungunya and West Nile. All resulted as negative. The repeated serology for CCHF came strongly positive after five days from the initial negative test, and accordingly patient started on ribavirin and he responded to it. His condition improved dramatically. Keywords: Crimean-Congo hemorrhagic fever; Oman; Arab peninsula; PCR; Cytokines. 1Department of Cardiovascular and Thoracic surgery, SKIMS, Soura, Kashmir - 190 011, and J And K Health Services. 2Department of Gastroenterology, SKIMS, Soura, Kashmir - 190 011, and J & K Health Services. *Address correspondence and reprints request to: Farooq Ahmad Ganie, Department of Cardiovascular and Thoracic surgery, SKIMS, Soura, Kashmir - 190 011, and J And K Health Services. Esophageal tuberculosis is rare in both immunocompromised and immunocompetent hosts with advanced pulmonary tuberculosis, even in countries with high prevalence of tuberculosis, e.g., South East Asia. This study presents a case report of esophageal tuberculosis presenting as dysphagia. 1Assistant Professor-Orthopedics, Chengalpattu Medical College, Tamilnadu, India. 2Head of Department of Orthopaedics, Ibri Regional Referral Hospital, PO Box 46, Ibri 516, Sultanate of Oman. 3A.G Hospital, Tambaram, Chennai, India. *Address correspondence and reprints request to: SS Suresh Head of Department of Orthopaedics, Ibri Regional Referral Hospital, PO Box 46, Ibri 516, Sultanate of Oman. Various causes of common peroneal palsy have been described in the English language medical literature in the past. Authors report a case of foot drop in a post cesarean section patient, due to osteochondroma of the proximal fibula, which recovered completely after excision of the offending mass. Keywords: Osteochondroma; Fibular head; Common peroneal nerve; Entrapment neuropathy; Cesarean section. 1Department of General Medicine, Medical College and Hospital, Kolkata, India. 2Calcutta National Medical College and Hospital, Kolkata, West Bengal. India. 3Department of Endocrinology, Medical College and Hospital, Kolkata, India. 4Department of General Medicine, Medical College and Hospital, Kolkata, India. *Address correspondence and reprints request to: Subhasis Maitra, Calcutta National Medical College and Hospital, Kolkata, West Bengal India. We describe the case of a 30-year-old male, a known patient of type 1 diabetes mellitus (DM) on insulin therapy, seeking medical attention for recent onset repeated attacks of hypoglycemia associated with generalized weakness and darkening of skin. Further evaluation and screening revealed autoimmune adrenal failure together with presence of Hashimoto’s thyroiditis. The patient was diagnosed as a case of autoimmune polyglandular syndrome (APS) type II with complete triad of Addison’s disease, type 1 DM and autoimmune thyroid disease. Anti-thyroid peroxidase, anti-glutamic acid decarboxylase and anti-endomysial antibodies were present in our patient. He was started on replacement therapy with physiological dose of prednisolone and thyroxine resulting in marked improvement in his symptoms. Recurrent hypoglycemia in a type 1 DM patient should raise a suspicion of underlying autoimmune adrenal insufficiency. Absence of obvious signs of thyroid dysfunction also poses a diagnostic challenge for the clinicians. This article aims at highlighting the importance of detailed evaluation together with long term followup of these patients and their relatives as overt clinical disease may only be the tip of the iceberg of other underlying organ-specific autoimmune diseases that may develop later in the course. Keywords: Autoimmune polyglandular syndrome; Hypoglycemia; Type 1 diabetes mellitus; Addison’s disease; Autoimmune thyroid disease. 1Cardiothoracic Surgery Division, Department of Surgery, Sultan Qaboos University Hospital, Muscat. 3Formerly Director Wakefield Heart Centre and Clinical Leader Wellington Public Hospital, Wellington South, New Zealand. *Address correspondence and reprints request to: Ashok Kumar Sharma, Formerly Director Wakefield Heart Centre and Clinical Leader Wellington Public Hospital, Wellington South, New Zealand. Persistent left superior vena cava with absent right superior vena cava is a rare congenital anomaly with few cases reported to date. To the best of our knowledge, the current case is the first one to be reported from New Zealand. The condition may present difficulties in central venous catheterization, pacemaker electrode insertion and cannulation during cardiopulmonary bypass. We describe a case of persistent left superior vena cava with absent right superior vena cava, who presented with aortic stenosis (bicuspid aortic valve) and rhythm disturbances. Keywords: Absent right superior vena cava; Persistent left superior vena cava; Vascular malformations. Dawood Al Riyami, Al Shaaili K, Al Bulushi Y, Al Dhahli A, Date A.
Dawood Al Riyami*, Al Shaaili K, Al Bulushi Y, Al Dhahli A, Date A.
Sultan Qaboos University Hospital, Muscat, Al-Khoud, Sultanate of Oman. *Address correspondence and reprints request to: Dawood Al Riyami, Sultan Qaboos University Hospital, Muscat, Al-Khoud, Sultanate of Oman. Objective: To study the pattern of glomerular disease (GD) from the result of renal biopsies at our center. Methods: We conducted a retrospective review of 190 adult native renal biopsy reports from the pathology registry of renal biopsy performed at our hospital between 1992 and 2010. Results: Lupus nephritis was the most common pathology 48/133 (36.1%) with a female preponderance. The most common primary glomerular disease was focal segmental glomerulosclerosis (FSGS) 26/133(19.5%), followed by membranous glemerulopathy (MGN) 13/133 (9.8%), and mesangial proliferative glomerulonephritis 6/133 (4.5%). IgA nephropathy and acute proliferative glomerulonephritis each accounted for 4/133 (3.0%). Membranoproliferative glomerulonephritis accounted for 3/133 (2.3%). Focal proliferative and cresentic glomerulonephritis each accounted for 2/133 (1.5%). Vasculitis was not common and there was no report of anti-GBM disease. Conclusion: Among the secondary glomerular diseases, lupus nephritis was the commonest condition with a female preponderance. Among the primary glomerular diseases, FSGS was the commonest. These results are consistent with global trend. IgA nephropathy is not common as the case in the Caucasian population. Vasculitis was not common and there was no report of anti-GBM disease. Keywords: Renal biopsy; Glomerular disease; Epidemiology. 1President, Simulated Microgravity and Human Body, JBR Institute of Health Education Research & Technology, KSI, South Carolina, USA. 2JBR Institute of Health Education Research & Technology, India. *Address correspondence and reprints request to: Balwant Rai, President, Simulated Microgravity and Human Body, JBR Institute of Health Education Research & Technology, KSI, South Carolina, USA. Objectives: The aim of this study was to test the association between quality of sleep and stress in individuals with TMD (temporomandibular joint dysfunction) in simulated Mars mission. Methods: The 24 healthy crew members were recruited. The physiological measures of systolic blood pressure (SBP), diastolic blood pressure (DBP), and heart rate (HR) were recorded. The Symptom Checklist-90-revised was used which was based on nine dimensions of psychological functioning. The Multidimensional Pain Inventory was pain severity, social and physical activities, affective distress, social support, and feelings of life control. The Pittsburgh Sleep Quality Index was used to measure the number of hours spent in bed and during asleep, frequency and reasons for awakening, and difficulty returning to sleep after awakening. The orofacial pain questionnaire was applied to measure pain experience using descriptors from the McGill Pain Questionnaire. Salivary cortisol and melatonin were measured. Results: The 15 crew members reported temporomandibular joint pain after 6 days of mission. On dental examination, 5 crew members reported simple muscle pain (SM) and other 10 crew members with TMD. The TMD group endorsed more affective descriptors of their pain experience. Compared to the TMD group, the SM group also reported significantly poorer sleep duration. The TMD group reported nonsignificantly more daytime dysfunction than the control. Higher levels of salivary cortisol and salivary melatonin were reported in the TMD group as compared to other group. Conclusion: This study concludes that both quality of sleep and stress levels due to extreme condition (simulated Mars mission) were associated with TMD in simulated Mars mission. Keywords: Temporomandibular joint dysfunction; Sleep; Stress; Mars mission; Simulated.